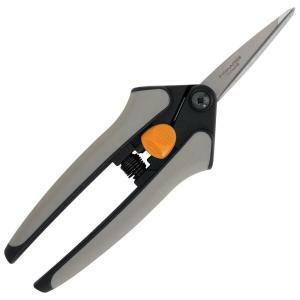 These Pruning Snips will be your favorite finishing touch tool. They think you’re laboring over every leaf and blossom, but you know that deadheading, shaping or pruning even the densest plants is as simple and quick as a precise, decisive snip. Easy-open spring action reduces hand stress while cutting. Super sharp, Micro-Tip® blades give you top-of-the-line precision and control. Fully hardened stainless steel blades holds sharp edge longer. Comfortable Softgrip® handles reduce stress and are non-slip for safety. Right or left-handed use. Blade cover protects you and the blades when closed.